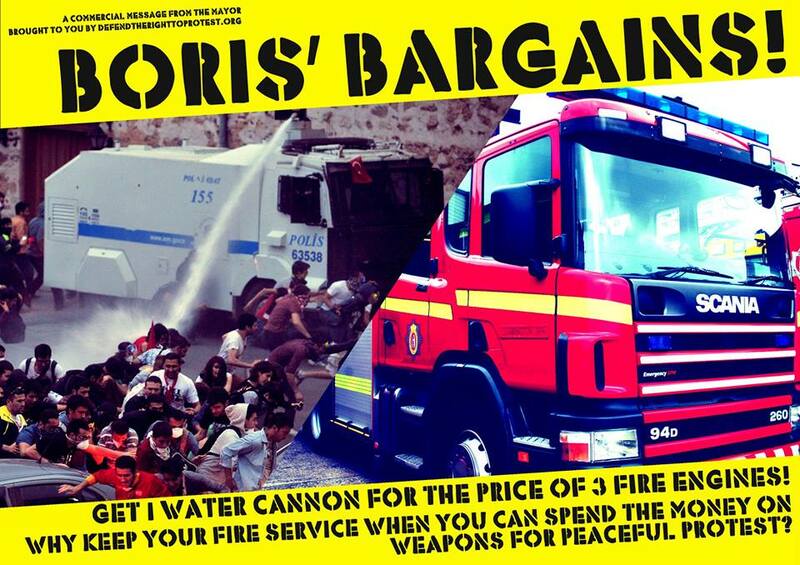 Just weeks after Theresa May lambasted the Police Federation for the damage caused to public trust as a result of a string of scandals -from Hillsborough to Plebgate – Boris Johnson has purchased 3 water cannon for use by the Met. Whatever Boris’s move reflects about on going conflicts in the Tory party, it is a very dangerous one. Water cannon by the Association for Chief Police Officers (ACPO) own admission “is capable of causing serious injury, even death”. The water cannon are being purchased from Germany – where 68 year old Dietrich Wagner, was blinded during an environmental protests. His eye sockets were ripped out by the water pressure – which had it continued much longer – would have killed him. This is the weapon that the Met want to use to deal with “continued protest” against “ongoing and potential future austerity measures”. It is an utter disgrace that in a city where 100,000 people are reliant on food banks, a weapon costing over £200,000 is being justified on the basis that it is a “bargain”. As MP Keith Vaz was moved to say “we are not talking about a special offer at Lidl”, but the introduction of another dangerous weapon which can only lead to more unaccountable police violence on the streets of London. Once in use, Water cannon will also need to be replenished at an estimated cost of 600,000- 1 million per cannon 2-3 x the cost of a fire engine. The life threatening head injury suffered by Alfie Meadows following a blow with a police baton took place one of three events (student protests) chosen by the Met as examples of public order situations where water cannon could have been deployed. This followed the death of Ian Tomlinson the year previously after he was pushed over by PC Simon Harwood whilst trapped in a police kettle. 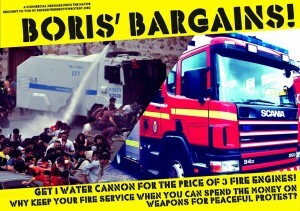 Boris is trying to make water cannons a fait accompli and we have to stop him. We call on everyone to pile on pressure against the introduction of water cannon.